You guys have all been around long enough to realize I am no good with moderation, right? I am always swinging WAY off the scales? That's what I do! Once I decided to add blue (see previous post), I just went for it. I added yellow too! The chain runs 3 1/2 times the length of my house. Anyways, it reminded me of my former day-job. Taking apart something perfectly OK and adding a bit of extra colour. I worked with spreadsheets and reports, not stapling papers...but it was the same. A seemingly endless task that I had to plough through. Only, I was quite relaxed working with my hands, and I was anything but relaxed at work. pps. Seriously, if you want to re-use the chain...please leave me a comment or send me an email and we can arrange it! It will be going outside, but I am sure most, if not all of it will be salvageable! ppps. You have no idea how fun building this was! 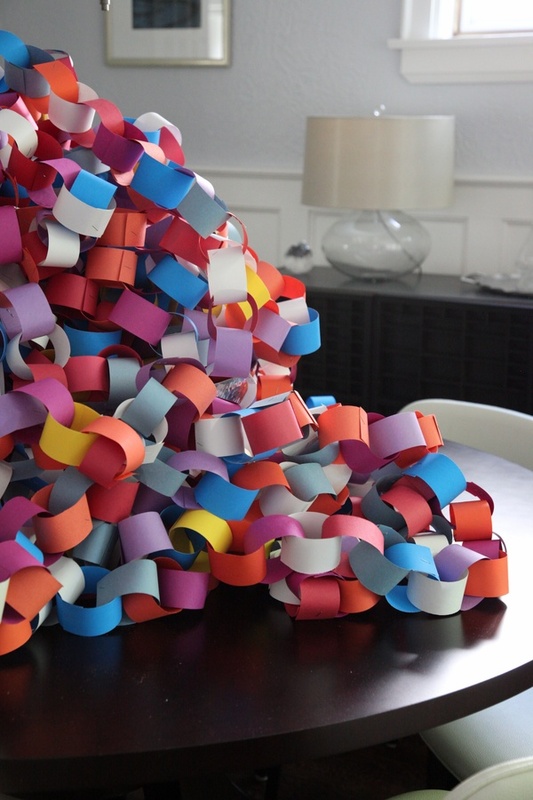 its nice of you to offer to give it away, but i'm pretty sure once you get it hung up you're not going to want to take it down...love the color combinations. so fun! How fun! Have a great party day! I have to say, I thought the chain looked good before, but it looks great now! The extra effort was worth it, for sure! 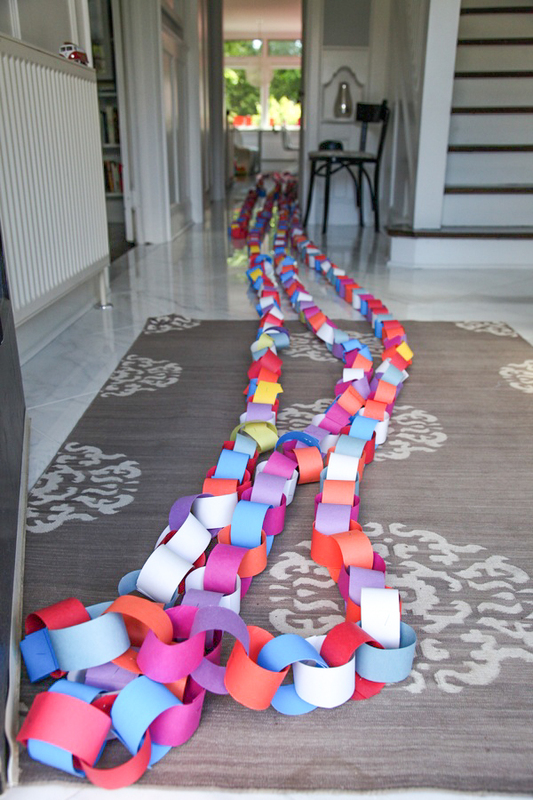 I teach preschool and we made giant paper chains for Thanksgiving and for Christmas. I got a couple of the older kids to help me and they loved it and so did I! It was so calming and actually fun! I hope the party is fantastic! I'll keep my fingers crossed for good weather for you! You are too funny!!! The blue makes ALL the difference, though... SO worth the effort! Well done! Enjoy the party! It will come down! I couldn't bare to see the dew get to it! I hope someone is a taker...because I don't want to throw it away! I know it's only $10 worth of paper...but still!